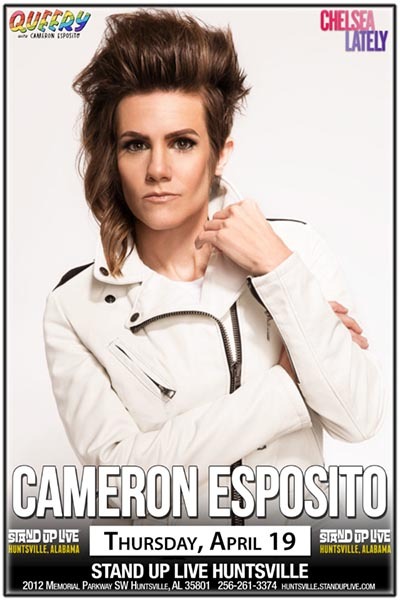 Cameron Esposito has appeared on LOGO, NPR, at TBS' Just for Laughs Chicago, SXSW, the Aspen Rooftop & Bridgetown Comedy Festivals (Portland Mercury Best of the Fest). Cameron got her start in improv comedy at Boston's ImprovBoston & Improv Asylum, trained at the Second City Conservatory & began her career as a standup in Chicago. Cameron has earned a Chicago Magazine Best of Chicago, toured nationally as a circus ringmaster (nope. I'm not kidding.) & created SIDE MULLET NATION, a solo show that debuted as a part of TBS’ Just for Laughs Chicago (Time Out Chicago Critics’ Pick, Chicago Reader Recommended & AV Club Best of the Fest) & has played across the country, including at New York’s Upright Citizens Brigade Theatre (Time Out New York Critics’ Pick). Cameron relocated to LA in fall 2012 & since then has been named one of the top 12 LA Comedy Acts to Watch in 2013 by LA Weekly, a Best of 2012 by LA’s thecomedybureau.com & launched Put Your Hands Together, the only weekly standup show at Los Angeles' Upright Citizens Brigade Theatre. Known for her “effervescent storytelling” (AV Club), Cameron is the brains and voice behind revolutionary all-standup podcasts Standup Mixtape (Underground Communique Records) and Put Your Hands Together (aspecialthing records). She is also the host/creator of the Wham Bam Pow action & scifi movie podcast on the Maximum Fun network. Cameron is also the founder of the Feminine Comique, the world's only all-female standup course. Her debut album, Grab Them Aghast, was released in 2010 on Rooftop Comedy Records.